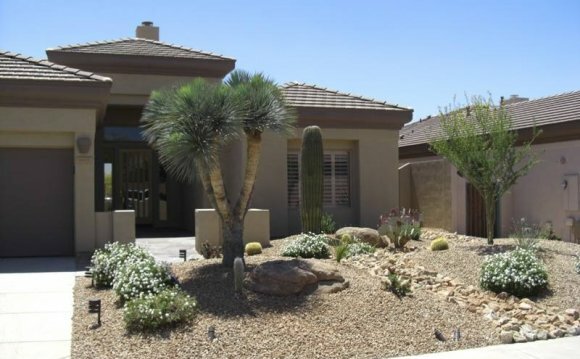 This Southwest front yard landscape design is not only a great example of Southwest landscaping but also a true example of the principle of simplicity. The planting ideas follow xeriscaping principles and are kept to a minimum of species and color combinations. The elements and shape in this Southwest front yard all exhibit a desert, Santa Fe, Arizona design style. All the plants in this plan are of a drought tolerant nature common in xeriscaping. Even the lawn area which is a mixture of Buffalo grass, Blue Grama, and wildflowers is perfect for a desert landscape scene. The two curvy areas in the lawn are actually limestone boulders that create a 12" high shelf that descends back. This adds a second level to the yard which generaly adds interest to most landscaping and garden design ideas. The pathway is dark red pea gravel which isn't necessarily the best element in most instances for a garden or landscaping path. It is easily moved by wind, rain, and foot traffic as well as being picked up in shoes and tracked into the house. Why did we use it here? Sometimes the wishes of our clients override our professional advice. And ultimately, everyone should have what they want. The white ground cover is native 2" river rock. Creating contrast in design can often be very appealing. As well as the differences in color, differences in size, texture, and composition can also create a pleasing contrast. This is just a front yard of a square box house. However, as you can see, the curves take away the squareness of the home. Curves are typical for desert southwest landscape design as well as my own favorite style.